Grevillea Long John looks like a small pine when not in bloom. When the blooms show up they are an exotic surprise. Grevillea Long John forms a great screen, 10 feet or more tall. I have not been able to test the limits for heat, cold or drought because for Grevillea Long John. My conditions have not been foul enough. I don't water it and we have been down to 16° F for some time without evidence of damage, Grevillea Long John was still blooming. The only Grevillea Long John plants I lost were planted in an area that became boggy during a wet winter. Our climate seems to suit Grevillea Long John just fine. 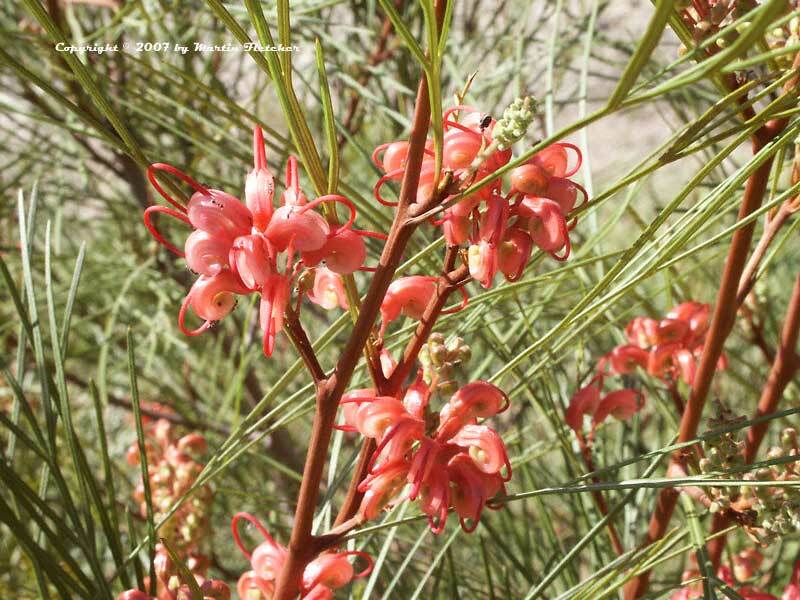 Grevillea Long John is a great plant for the hummingbird garden. Flowers and foliage of Grevillea Long John. High resolution photos are part of our garden image collection.